In late November, 1983, my dad, Paul W. Spitzer, along with my sisters Carol, age 11, and Joy, age seven, drove from Florida to our home in Maryland. My father and sisters attended church with us the Sunday morning before Thanksgiving. We had special prayers of dedication for our new son, Kyle. Our family spent precious time together throughout the week. I especially remember our son, Paul, who was age four at the time, telling his grandpa a couple of jokes. Special prayers of dedication for Paul Spitzer’s new grandson, Kyle Spitzer. Paul W. Spitzer stands with his arm around daughter Joy’s shoulder; surrounded by his family. My grandparents arrived, and together we all feasted. My father enjoyed all of his favorite foods that night: roast turkey, stuffing, mashed potatoes and gravy, baked oyster casserole, succotash, sweet potatoes, home-made rolls, sauerkraut with pork, stuffing, and seventeen pies. After a very nice evening, we went back to our home in Maryland to sleep. Mornings came early for me. In addition to my job as a cartographer at AAA, I also had a paper route. The extra money I earned covered the rent on our townhouse each month. My father volunteered to get up at 3:30 a.m. and accompany me. I have often thought how I would never do that. If I visit any of my sons, I would sleep in and spend some time with them later. But that was my dad. “The hair family” 1974 Paul and Dian Spitzer, Laurie, Ben, Steven, Sharon and Carol. Joy would come along a few years later. Dad helped me in preparation for delivery. As we sat by the car bagging the papers and talking, he mentioned to me that the Lord had been impressing on his mind and heart verses from 2 Corinthians 4 and 5. I was surprised and thought this was an amazing coincidence, because I had just memorized those chapters from the Bible. The two of us spent quite a bit of time discussing the Scripture passages together. As I thought back on that morning and our discussion, I recalled that my father’s main concern for each member of the family was how they were doing in their spiritual life. More specifically, he was concerned with how each person’s relationship was with Jesus, the One that he loved with all of his heart. All of us “orphans” together at my 50th birthday bash. Left to Right: Ben, Joy, Sharon, Carol, Laurie, Steven. I remember my dad starting all of his prayers at dinner and other times with a long, thoughtful, sigh… “Lord,” he would begin. As a young boy, this drove me crazy. “Here comes one of dad’s long emotional prayers,” I would think to myself. After delivering the papers, we went back to our townhouse where we both laid back down to get a little more sleep. After resting, our plan was for my dad to our use our small Nissan Sentra for the day so that we could drive his larger Buick and take the rest of the family to the National Zoo in Washington, D.C. My wife, Leah, joked with him to be careful with our new car. Dad responded, saying that he had never been in an accident with his car before. Though others had wrecked his cars, he never had. My father got up from his nap before I did, and he left to meet his sister, Betsy, for breakfast. Some time had passed when we received a phone call from my aunt, asking if my father was there because he had not arrived. We were shocked and stunned to hear that while my dad was traveling north on US 1, a car coming south lost control, swerved and hit him head-on. My father, 47 years-old, was dead at the scene and the young man that hit him died shortly afterwards. This tragic news, of course, was a major shock to our entire family. I will never forget the call from my Aunt Betsy, saying, “Ben, he’s dead!” I remember my youngest sister, Joy, climbing into my lap, and the two of us sobbed together. My other sister, Carol, was at my grandparents’ house. The next few days were like living in a fog, as family and friends came together for the funeral. My dad was buried in Back Creek Valley, West Virginia, his boyhood home. While I don’t understand my dad’s untimely death, I do believe God was preparing my father. I recently had the opportunity to talk to my priest, Father David Harvey, and asked him to show me the verses from the Anointing of the Sick and Last Rites. 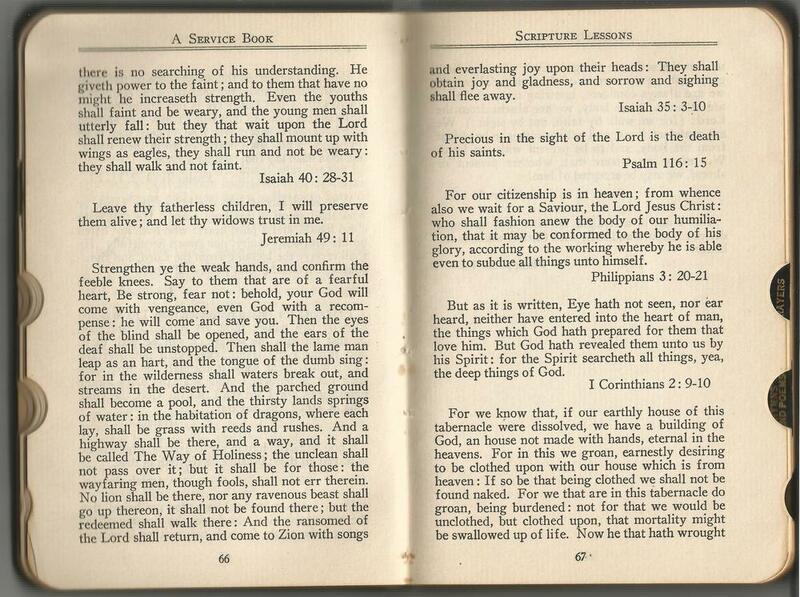 At the bottom right page are verses from Corinthians. This is the book that my great-grandfather, the Reverend Benjamin F. Spitzer, used for funeral services. Recently, my sister, Carol, reminded me of how – during our dad’s funeral in the mountains of West Virginia – the sun broke through a cloud-covered, stormy sky. The sunlight streamed through the church window, and directly on my good friend, John LaFave, as he sang Love Is, one of my father’s favorite hymns. For years, my father drove John crazy with a request for that song each time they saw each other. Every time, John would honor that request. And here, the day of the funeral, with the sun streaming through, it was as if my dad was asking John, once again, to play that song. Ten years later, in 1993, my mother died at age 55. We were all by her side in the hospital. She had been very ill with lung and heart problems. As her last moments approached, I noticed that she was obviously looking beyond us, as if she saw something we did not see. She sat up in bed, which she had not done in weeks. She was trying to get out of the bed and go toward whatever she saw. She said, “I have to go,” and continued to attempt to get out of her bed. I felt guilty trying to hold her back, and felt that her spirit was trying to go, but that her feeble body was not able to go with her. It was then that she laid quietly back on the bed and peacefully passed on. I have recently been diagnosed with Parkinson’s disease. More words from Corinthians come to mind, as well as the discussion I had with my father on what was his last day. Was the Lord also preparing me? In His great mercy, isn’t He always preparing us, whether we are aware of it or not?